Once a year on Super Bowl Sunday, cross country skiers have a chance to ski a unique route from Harbor Springs to Cross Village. This year's event was rescheduled to February 24 due to snow conditions. The Loppet Nordic ski tour traverses 16 miles of public and private land allowing skiers access to some spectacular Northern Michigan ski trails. Sponsored by The Outfitter in Harbor Springs, the Loppet is a ski tour that has been a winter celebration for more than 3 decades. Each year, the trail is determined-it varies each year-and is groomed by snowmobiles for several weeks prior. Skiers can ski the entire route or begin at two other spots. 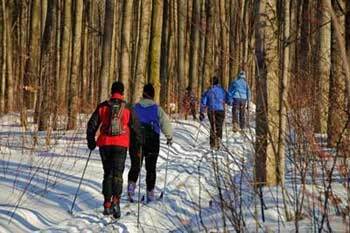 A Loppet is a social ski tour that traverses miles of trails. This year, the Loppet begins on LaCount Road. Skiers can also start the Loppet at one of the two aid stations on Middle Village and Wilderness Road. The trail winds through logging trails, open fields, and woods. The tour ends at the Crow's Nest restaurant for food and celebration. Registration for the Loppet is limited to 120 skiers.